Our doctors have built an extensive website dedicated solely to bioptic driving. This website has information about the history of bioptic driving, the systems used for driving, patient success stories, the training need to become a bioptic driver and lots of other information on the process. For more information on bioptic driving, please visit our BiopticDrivingUSA.com website. Millions of Americans face the possibility of losing their ability to drive or never becoming licensed to drive. This may have a profound effect on their mobility, their employment and ability to live in a society that relies heavily on the automobile for transportation. While vision loss can often be so severe that driving is not an option, some individuals with moderate central vision impairment, but with good peripheral vision, may benefit from bioptic driving. Determining whether a visually impaired individual may drive requires a multidisciplinary approach involving the low vision specialist, physicians, driving rehabilitators, occupational therapists and orientation and mobility instructors. It includes a number of checks and balances to rule out those patients who would not be safe, while identifying those with the potential to be a safe driver. Moderate decreases in central vision without a major loss of side vision work well for bioptic driving. Patients with mild to moderate vision loss including optic atrophy, albinism, macular holes, macular dystrophies and mild dry degeneration may be helped. The stability of the eye condition is also important. Patient with rapidly deteriorating vision such as wet macular degeneration or with progressive loss of side vision such as in retinitis pigmentosa would not be good candidates for bioptic driving. Patients with severe color vision loss such as incomplete achromatopsia and cone dystrophies can sometimes be helped with the addition of special red central contact lenses to improve the detection of the color red. Each case, however, must be looked at individually by your doctor. Dr. William Feinbloom designed the first bioptic system in the 1950s. He defined a bioptic as a small telescope mounted in the superior portion of the eyewear or carrier lenses. This type of system allows for rapid fixation changes from the carrier lenses to the telescope. Dr. Feinbloom was among the first to recognize the potential for bioptic eyewear to be used in driving. During the 1970s and 1980s, bioptic driving emerged as a viable option to aid a select group of mildly visually impaired individuals continue as licensed drivers. California began issuing bioptic driver’s licenses in 1971. On May 1, 1977, New York adopted new laws allowing for bioptic driving. In 1984, the Department of Transportation issued a statement that indicated the visually impaired should not be discriminated against. DOT’s action, though of limited power, did lead to more states looking at the option of bioptic driving. Since that time a majority of states have adopted bioptic driving licensure. In 1986, the Indiana Bureau of Motor Vehicles developed guidelines for bioptic driving with input from the Indiana Low Vision Rehabilitation Society, Indiana Optometric Association, Rehabilitation Driving Specialists and key low vision practitioners, including Dr. Richard L. Windsor. Indiana has over seven hundred licensed bioptic drivers. It is estimated that by 2001, there were over 4,000 licensed bioptic drivers in the United States. According to Dr. Eli Peli, Senior research scientist at Harvard, currently 34 of 51 legal jurisdictions allow bioptic driving. Bioptic Telescope: A bioptic telescope is a small telescope that is mounted into or upon the carrier eyewear to create the bioptic system. For driving, powers of 2X to 5.5X are commonly used. Carrier Lenses: The carrier portion of the bioptic system is the general spectacle lenses on which the telescope is mounted. The carrier lenses may be single vision or bifocal lenses. In Indiana, the person must have the best corrected carrier visual acuity of 20/200 or better in one eye. Visual acuity through the bioptic system must be 20/40 or better. The person must have adequate color vision to see traffic and brake lights. Additionally, a peripheral visual field of 120 degrees total in one or both eyes combined is needed to be a candidate for bioptic licensure. The candidate must be examined by a doctor of optometry or ophthalmology and have an application for a bioptic driver’s license submitted by his low vision specialist following fitting and training with the bioptic. A rehabilitation driving evaluation must be performed by a BMV approved driving rehabilitation specialist. The bioptic application completed by the doctor and the results of the driving rehabilitation specialist’s evaluation are submitted to the Medical Advisory Committee for approval. If approved, a permit is issued which may only be used with a driving rehabilitation specialist. Thirty hours of behind-the-wheel driver’s training must be completed. If the driving rehabilitation specialist determines the patient has achieved mastery in driving with bioptics, the patient is referred for an extended behind-the-wheel evaluation by the Bureau of Motor Vehicles followed by an extended driving road test by the BMV. The Indiana program has served as a model for bioptic driving. It has a number of checks and balances so that any problems that might reduce the driving safety of the individuals caught before licensure. The strong emphasis on training is crucial. The thirty hours of training assures the patient is trained under a wide range of driving conditions. The rules for bioptic driving vary by each state. Some states require behind-the-wheel driver’s rehabilitation. Others have more stringent limits on the patient’s residual vision and the type and power of bioptic systems may be limited. Principle One: 95% of Driving is Through the Carrier Lens Since the bioptic system reduces the field of view, the bioptic telescope is used only as a supplement to help with detail vision. Bioptic driver’s view through their normal distance lenses for most driving activities, but scan intermittently into the telescope to spot distant objects. This is much like the way a driver glances into the rear view mirror for a few seconds. Principle Two: Objects Appear Larger and Closer Bioptic telescopes enlarge the image of distance objects, thus improving the ability of the driver to see distance detail. Initially objects may appear closer through the bioptic. Principle Three: Multiplexing While glancing into the telescope, the patient can still see to the side. It takes practice to view an image through the bioptic while still maintaining a visual awareness of the peripheral vision to the side. Just as when we look into the review mirror, we are still aware of motion and movement around us. Principle Four: Movement is Also Magnified As objects are enlarged through the bioptic, they also will seem to move faster. Objects may seem to be “jumpy” through the bioptic. The patient must practice learning to use the system in a smooth and coordinated manner. 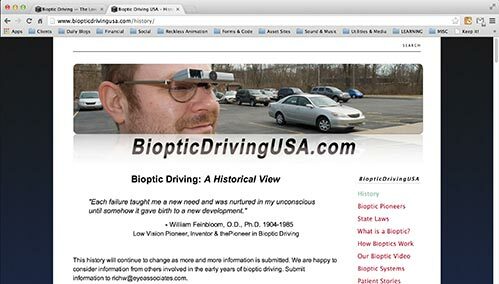 Steps in Becoming an Indiana Bioptic Driver Low Vision Evaluation: The first step is the low vision examination. The doctor that specializes in low vision will determine if you meet the requirements to apply for a bioptic license. Fitting with Bioptic System: The Bioptic system may be fit on one or both eyes. They come in a range of powers. The doctor will determine the type of bioptic system that is best for you. The completed bioptic system must be carefully fit to your face. In Indiana, all bioptic systems up to 4X power may be used and higher powers as approved specifically by the BMV. Currently, the 5.5X Beecher Mirage has been approved for bioptic driving. Some states may only allow lower power telescopes. Training in Use of the Bioptic: After receiving your bioptic system, you should be trained in its use by the low vision specialist, low vision technician or mobility and orientation specialist. Only when you have demonstrated the ability to use the bioptic, may the doctor sign your BMV bioptic application and refer you for the behind-the wheel evaluation and training. In our program, we have developed a training manual with a CD-Rom of tools. Patients must successfully master the required skills with the bioptic before they may proceed to the driving evaluation and training. There are four different types of spotting through the bioptic that patients must become proficient at. The first skill to master is spotting stationary objects. The next step is to be able to spot moving objects and track them with the scope while the patient is stationary. Once the patient has mastered spotting moving objects, they proceed to spotting stationary objects while the patient is moving. Next, the patient learns to spot moving objects while the patient is moving. This whole process of spotting with the bioptic telescope should only take a matter of a 1 to 2 seconds to accurately locate and view the object for identification. Behind-the-Wheel Evaluation: Your doctor will refer you to a rehabilitation driving program. Following basic tests of perception and reaction time, a behind-the-wheel driving evaluation will be performed. If you perform adequately, your application will be forwarded to the BMV with the report of the rehabilitation driving specialist. BMV Review of Application & Issue of Permit: Your application and report of the driving rehabilitation specialist will be reviewed by the Indiana BMV Medical Advisory Committee, and a bioptic driving permit may be issued that will allow you to train only with driving rehabilitators. You may not drive without that trainer. Behind-the-Wheel Driver’s Training: Indiana requires 30 hours of behind-the-wheel training. It is important to drive in a variety of weather and lighting conditions. The 30 hours may be waived in the case of an experienced bioptic driver who has been previously licensed in another state. BMV Driving Evaluation: After your driver’s training is completed, your trainer will arrange an extended behind-the-wheel test at a local license branch with an evaluator experienced with bioptic driving. If you pass your test, you will be issued your bioptic license. You must wear your system at all times when you drive. Follow-up Eye Examinations: The State of Indiana requires an annual or biannual eye examination, depending on the eye problem, with report to the Medically Advisory Board. Failure to complete these checkup can result in cancelation of the license. Color Vision & Bioptic Driving Issues Color vision is important while driving. You must rely on your ability to see the red brake lights and the determine what the color of the traffic light is . You must be able to discern these color differences easily while driving. Many adaptations including special filters can be used while driving with a bioptic system. Contact lenses with special filters may also be used. Color vision problems should be addressed with your doctor before the behind-the-wheel training. Bioptic drivers must have good glare and light protection when driving. Driving in a variety of lighting and weather conditions, from very sunny days to hazy overcast days, is a must. Additionally, glare from the road, the windshield, oncoming cars, snow and rain, etc. may affect your vision and ability to drive safely. Special filters can be used to decrease glare and light sensitivity when driving. You may need a variety of filters to help control glare and light in different lighting conditions. Discuss any glare and light problems with your doctor. Night Driving The ability to drive at night will depend both on the rules in your state and the type of vision problem. Those patients with conditions that are not adversely affected at lower light levels or bright headlight exposure such as albinism may be candidates for night driving. The BMV may require a report on a night time evaluation by a driving rehabilitator and the recommendation of the low vision specialist. Bioptic driving has become a successful alternative for some mildly visually impaired people. The process of becoming a bioptic driver differs in each state. The Indiana rules serves as an excellent model for other states. It includes a series of checks and balances and places strong emphasis on training with the bioptic system and driver’s training to ensure the safety of each driver. It also includes an extended behind-the-wheel test by the BMV. New research and technology will continue to help us improve our ability to help our bioptic patients drive safely.